Set on the beautiful sands of Mission Bay, this resort offers a variety of options for the entire family to enjoy – from spa and pool activities to tennis and sailing. The hotel offers 357 stylish guest rooms including 8 spacious suites. Guests can enjoy waterfront dining at Acqua California Bistro, or relax with a cocktail by the outdoor fire pits at The Olive Lounge. 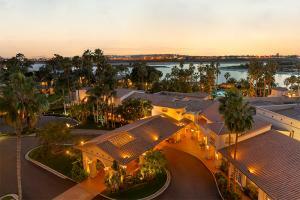 Located just 6 miles from San Diego International Airport. A'roma Cafe; Acqua California Bistro - American cuisine. Balboa Park, Belmont Park, Legoland, Pacific Beach, Gaslamp Quarter, La Jolla, Coronado Island, Sea World, San Diego Wild Animal Park, San Diego Zoo, Seaport Village, Old Town.